Now you know my secret. I store garlic, potatoes, and onions in our cookie jar. It’s dry and dark in there, and no one suspects that Cookie Monster’s belly is full of healthy vegetables. Plus, I don’t have to sacrifice drawer or cupboard space to store these items that shouldn’t be refrigerated. 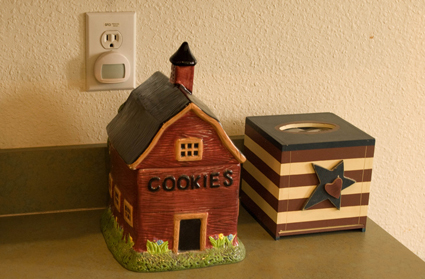 Reader Sharon stores all of her chargers in her cookie jar, which sits right next to an electrical outlet. The chargers are where she needs them, and nicely stored when not in use. Do you have any storage spaces in your kitchen that you use in creative ways? Let us know about them in the comments. I have an antique metal breadbox on my (otherwise clear) counter. I use it to keep all our vitamins and daily medications handy but out of site. Storing potatoes with onions causes both to spoil faster because of the gases released. So I think you should change up your storage strategy. Just a thought. Cookie jars for gourmet coffees, bulk goods, or plastic bags. Vintage coffee cans for coffee storage, if you like them. My mp3 sleeps in a carnival glass sugar jar–in the bedroom. 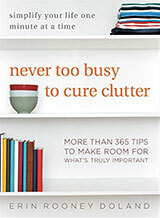 This is more in the area of uncluttering rather than storage. My son has always brought me “beautiful rocks” that he finds on his adventures. (He’s almost 11 and still bringing them to me.) The largest rocks line the window sill in the kitchen, but the smaller ones are in a clear glass vase on the counter top. I don’t have to move a million rocks to clean the sill, and I can still appreciate his offerings. Every once in awhile I simply dump the vase, rinse the whole lot and put them back when dry. oh man, I love the cookie monster cookie jar. Love those googly eyes. I have a 1950’s chrome plated globe-shaped bunwarmer that is inexplicably embossed with penguins and bakelite flipper-shaped handles. They were all over the garage sales in the 80’s and my girlfriends and I made a point of buying them for each other. Anyway, over the years it has held illicit drugs, incense, feminine hygiene products, and now it holds loose change and school lunch money. A moment of silence for the progression, please. Brilliant! This was a head slapping post – why didn’t I think of that – moment for me. Hopefully I will remember where I “hide” everything. My husband was always bringing home screw, nut bolts, etc. I had a brushed chrome canister set but never used the Tea canister, so I started putting hubby’s treasures in that canister. I acquired another canister set that went better with our “decor” so the brushed chrome ones went out to my husband’s workbench in the garage and he uses the whole set for his stuff. Now the second set is also out of the house and in hubby’s work area as I store flour, sugar and coffee in the refrigerator/freezer. We chill our wine in the crisper drawers. This is great! I was just noticing the other day my husband’s old milk-jug shaped oreo cookie jar in the corner of the counter. It’s currently empty and covered with dust (and has been since we were married, I think). We certainly don’t need it to be continually filled with cookies, and repurposing it will make my husband happy ’cause he’ll get to keep it, and me happy because it won’t just be sitting collecting dust. I have some drawers that we put in our bottom cabinets and I use one of them for storing potatoes. Helps keep them off the counter and in a cool, dry place. Now we know why Cookie monster looks like that, it’s all the garlic inside him, lol. But seriously, it’s a very good idea and I now have plans for my empty piggy cookie jar to become a bag container. I have a wooden breadbox on my counter & I store my teabags in sealed bags & containers in there. The top flips up & is shallow, so small quantities go there. The bottom section opens down & the containers go in there. I also bought 2-3 rectangular storage containers that fit in the lower section. (I did keep coffee in there for awhile) Everything ready in one place & ready for tea & company. I also keep my electric tea kettle next to it. 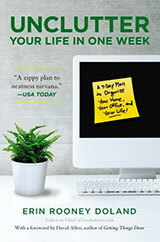 I keep a two-drawer filing cabinet in the kitchen with a few appliances in it, dog cookies, candy, spare vitamins to refill the weekly boxes, phone books, utility statements, and other sundries. I wonder if I can get rid of anything and put more counter top stuff in? That’s a great idea. I have to start looking for more sneaky storage spots. You just saved me the headache of what to do with this extra jar and where to put that dang charger I keep losing. I have a gorgeous ceramic jug we got as an engagement present. While in the past it’s been used as a vase, I now use it to hold random pens in teh kitchen as well as those gas candle lighters (we’ve accumulated a few), matches and an assortment of other odds and ends that would otherwise not have a home. Your house marked “COOKIES” contains no cookies. THIS IS A HOUSE OF LIES! Thanks for the idea. I have this bread box on top of my fridge that I don’t use, because if I put bread in it I completely forget about it until it’s too late. I like one of the ideas above where they used a bread box to store tea bags. This would free up some space in my cabinets and get some use out of the bread box. I also love the idea of putting rocks in a clear vase. My son also brings in rocks and I never know what to do with them, so I set them aside and they usually end up outside in the play area. But I do like looking at all the rocks he brings in, I know I must have a nice clear vase or clear jar where I can display all his rocks. Thanks for the tips! They are all great!! I have a covered casserole dish made of Blue Willow that sits on my counter full of various kinds of tea bags. It keeps tham close to the kettle and is prettier than all the little cardboard boxes sitting around. We use a beautiful white ceramic pitcher to put receipts in when we come home. It sits on a shelf near our front door. It’s deep enough that we can stick them in the bottom, and once they start to “creep” to the top I go through them in our office. In the bathroom I keep a box that is labeled for the cigars it once held, called “The Repeater”. It’s where I keep my tampons. I have a pretty white ceramic bread box in my kitchen that I store a hand mixer (to puree the fruit for my oatmeal)and some breakfast cereal. It’s covered and convenient in the morning. On my coffee table in the living room, I have a pretty teapot, cup & saucer and matching biscuit holder. In the biscuit holder, I store my ipod headphones. I love to store things in pretty dishes or boxes. I love the comment about the tea bags in the Blue Willow dish. This is such a good post… I’ve got at least three things in mind to do when I get home – bedroom, bathroom and kitchen will all be clearer. Plus jars I haven’t had the heart to get rid of will become useful! This is just false advertising. If I reached my hand into a friend’s cookie jar – especially a COOKIE MONSTER cookie jar – and found garlic and a dirty old potato instead of a cookie … well, let’s just say the friendship would be on the rocks. Potatoes in a cookie jar! What a cruel world this is. Great idea but my cookie jar almost always has cookies. Instead, I use a breadbox on the counter next to the stove to store all of my spices. I even write the names on the top of the lids on the ones in the back so it is a little easier to see what they are. I use my vintage cookie jar for dog biscuits and treats. 🙂 Easy access and doggies know the sound of the metal lid coming off means it’s cookie time! We have a beautiful little ceramic bowl that was given to us by a friend who is an artist; it holds keys and change up on the mantelpiece. The same friend also, for a wedding gift, gave us a lovely covered pot (maybe a bean pot?) that she made; my husband uses it for storing batteries and old keys that he doesn’t want to get rid of. It also sits on the mantel. 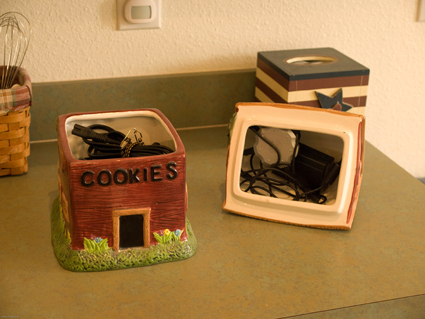 Great idea about storing chargers in a cookie jar. I store specialty teas in a decorative tea pot and dish cloths in a vintage pyrex bowl. I have four cookie jars. The Elvis cookie jar is for dry cat food. The other three are filled with homemade cookies! Stephanie Plum, the Janet Evanovich character who’s a bond enforcement agent who gets into amazingly funny adventures, is decidedly non-domestic, and keeps her small handgun in the cookie jar. I have a ceramic pumpkin that was made for serving pumpkin soup in. I keep it on my benchtop and store springloaded clothespegs in it because I use them all the time for fastening bags in the kitchen. I have several ceramic bowls/vases I made once, I keep them displayed on the bookshelf and mantel. Inside are those marbles and superballs the boys insist on losing around the house (ready to dole out one at a time), and dead rechargeable batteries waiting to be taken to the battery recycling place. Also the spare change, and in the bedroom, random small items like tweezers, clippers, hair clips, paperclips… Anything that would be messy clutter if uncontained. what a great idea! so glad i clicked back. we have an old (as in from my childhood) big bird cookie jar that would be just right to hold all those onions we have in a bowl on our counter. so much more attractive. I like the overall idea but I’m surprised that onions don’t rot faster in a nonporous container. I’ve heard the advice about storing onions and potatoes together also, but they live a long and peacable life together in my fridge drawer. (Specifically, the potatoes live a long life, accompanied by a frequently changing set of onion companions. re: vases full of special rocks. The clear glass hand soap dispenser on my kitchen windowsill has a small collection of semi-precious stones in the bottom, displaying them without using an extra container. The soap pump in the bathroom holds small seashells.